Roughly seven years after spending a few months in Boise, I finally returned to the state to climb its highest mountain. 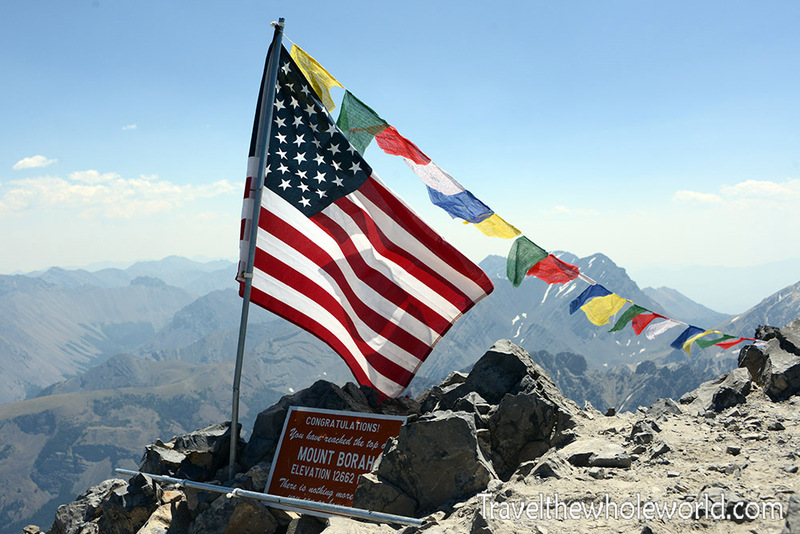 Borah peak was my first 50 state high point that I attempted in the northwest, and at the time was the hardest of the continental state high points I had climbed so far. 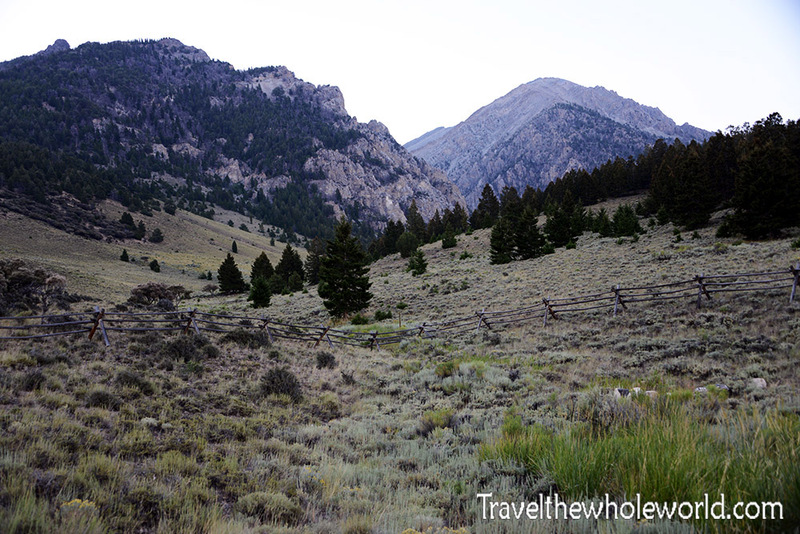 The adventure to the top of Idaho started off innocently enough, in the foothills of a dry valley surrounded by what looked like mostly large but gentle mountains. 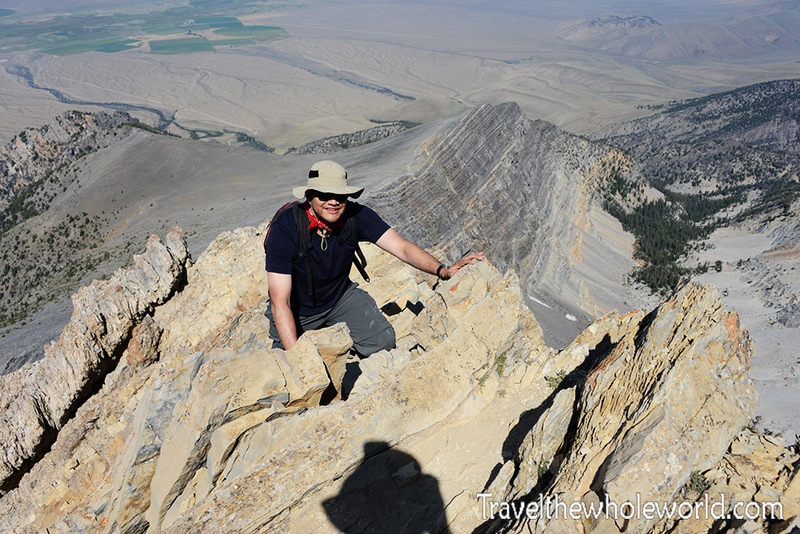 I had done some minor research on Borah peak a while back, but not really enough to know much about the climb. Pretty much I entered the trailhead only knowing that it was a dry peak with no water available, and there was a feature called Chicken Out Ridge that turned around any climber with a fear of heights. A local gave me a tip, which was to carry an extra liter of water and stash it somewhere towards the bottom of the trail, that way I could retrieve it on the way down. Maybe if you’re climbing weeks on end then I’d be more careful, but I’m a strong believer that a few extra pounds doesn’t make a difference, so I carried three liters of water plus an entire gallon jug that I placed in the bottom of my pack and headed up the trail. Just like people said, there is no water on the mountain. 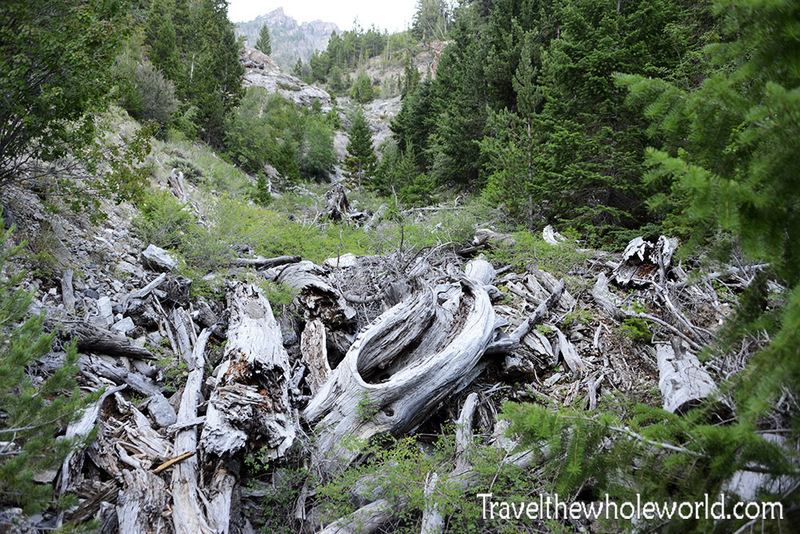 The photo above shows a dried out creek on the way up. Maybe in the early spring this would bring water from the melting snows, but by the end of July there was little snow left. 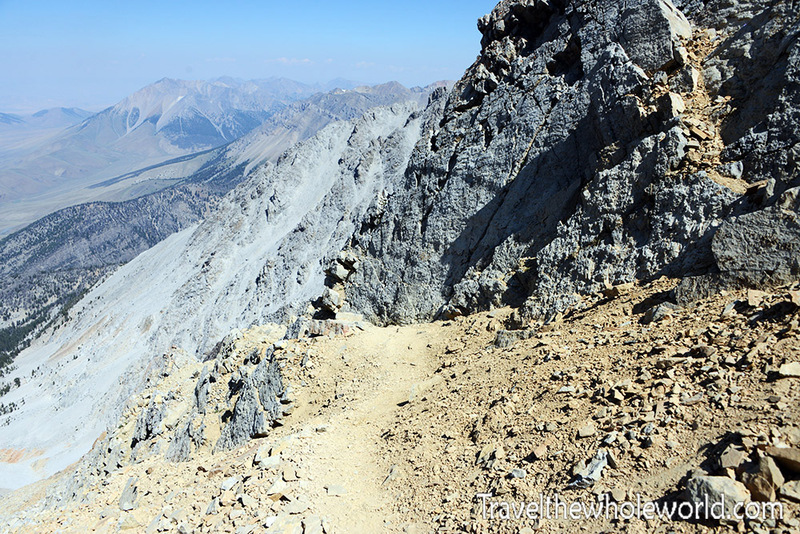 Borah peak is also known for its short but very steep trail to the summit. From the trailhead to the summit it’s only three and a half miles (5.5 kilometers), but gains 5,000 feet (1,500 meters)! While hiking up the first section of the trail with my friend, I found that the trail wasn’t necessarily super steep, just more relentless without any breaks. Just two weeks ago my friend and I had actually done much steeper trails in Shenandoah back in Virginia! 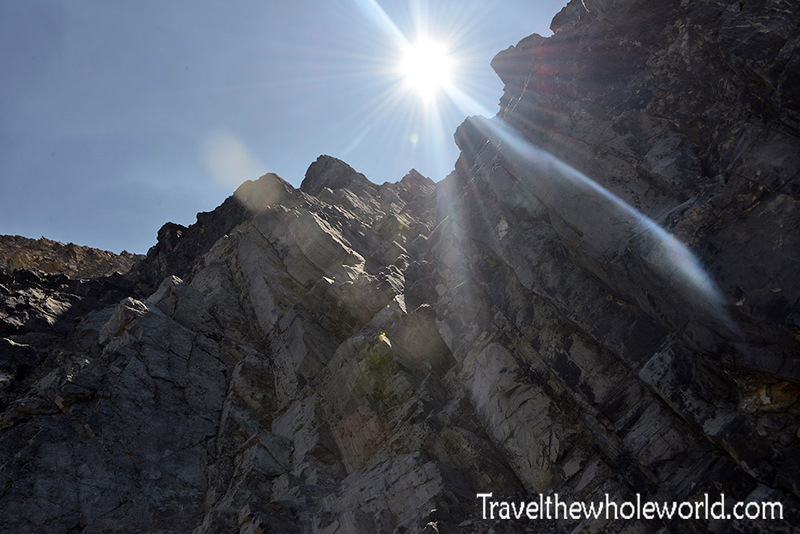 The trail can be very hot at the bottom of the mountain, but luckily in the morning you’re entirely in the shade. Most people seem to start the climb around six in the morning, and during that time the sun will be below Borah as you head up in an eastern direction. 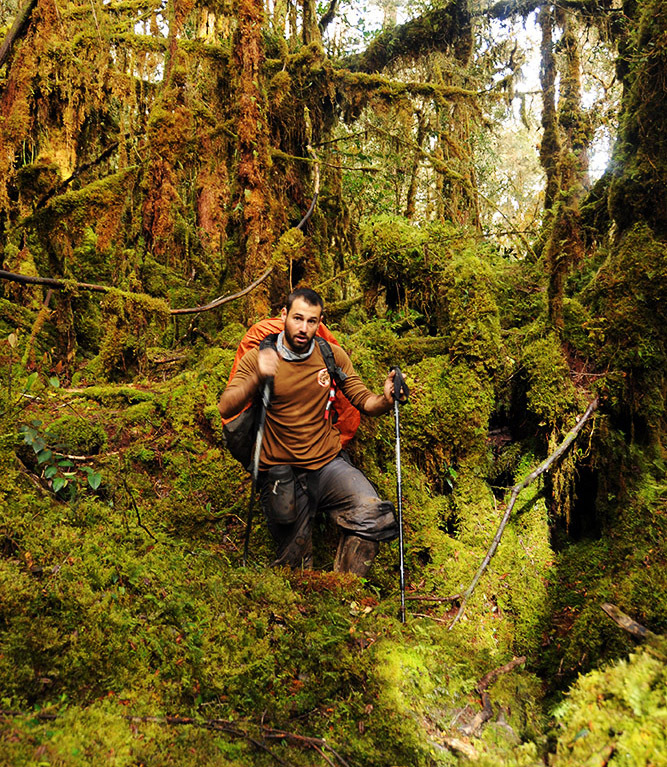 If you divide the climb into three sections, the first would be hiking this steep trail through a patchy forest. 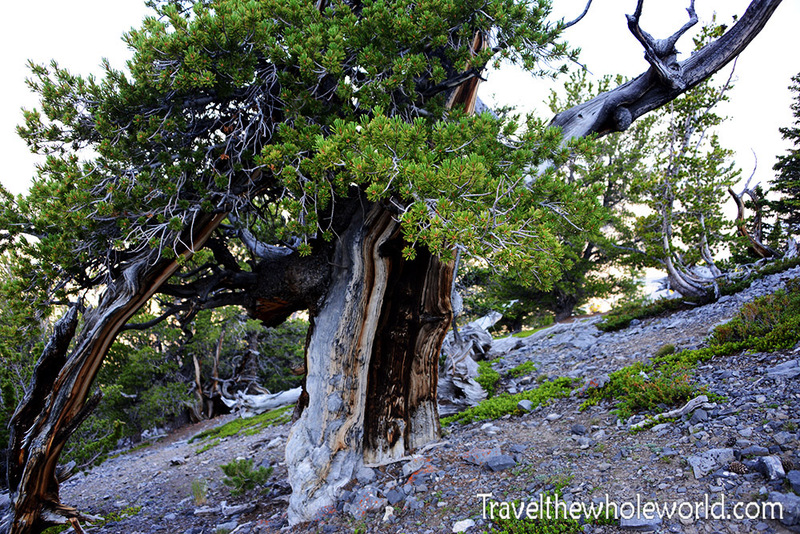 There are more switchbacks and scree as you get higher, and the trees eventually thin out. These photos were taken around 9,000 feet (2,750 meters). After leaving the forest, you’ll enter what I’d call section two, which begins after your uphill climb ends on a ridge. 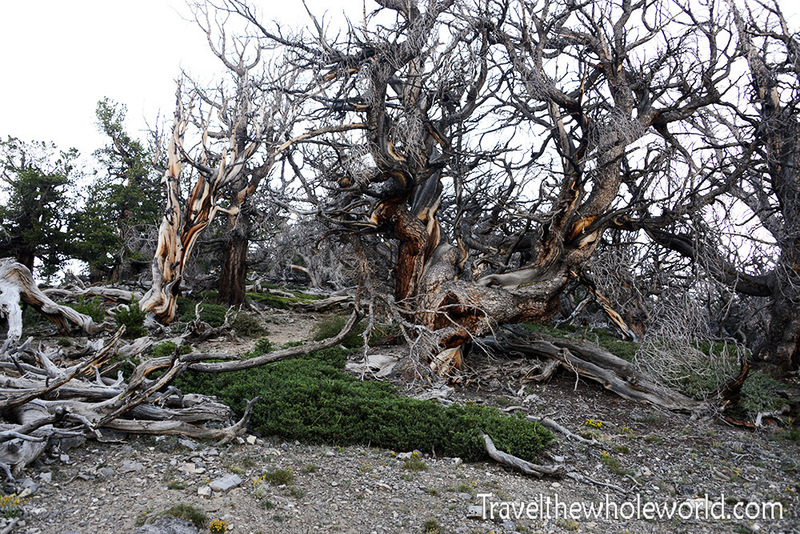 The ridge is just over 10,000 feet (3,000 meters), and by now you’re out of trees and directly in the sun. 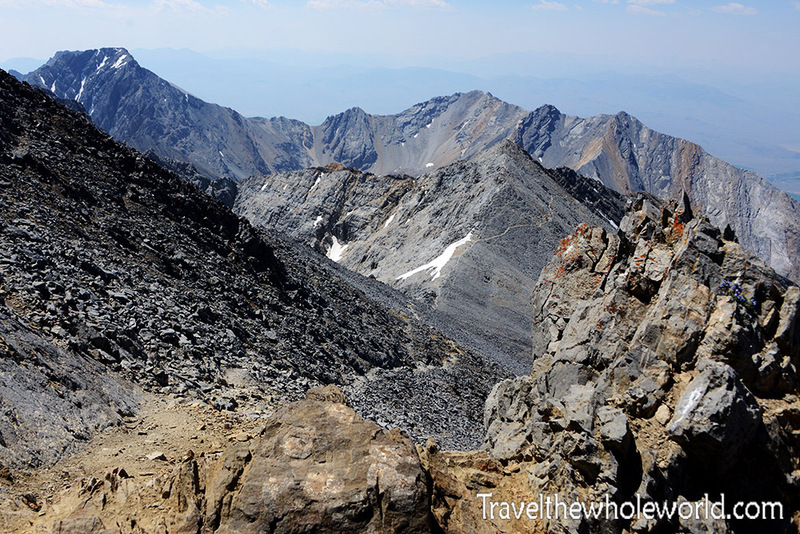 Instead of continuing directly east, you’ll traverse southeast while Borah Peak sits in clear view to your left. 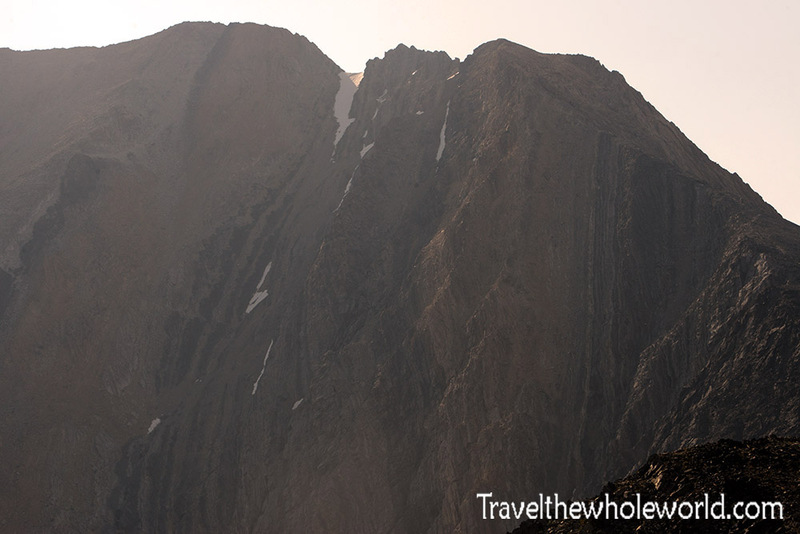 The ridge gradually rises to 11,500 feet (3,500 meters) and is the only gentle part of your day. My friend and I figured the beginning of the ridge was an excellent place to have a long break, since it is exactly half way up the mountain in terms of elevation gain. 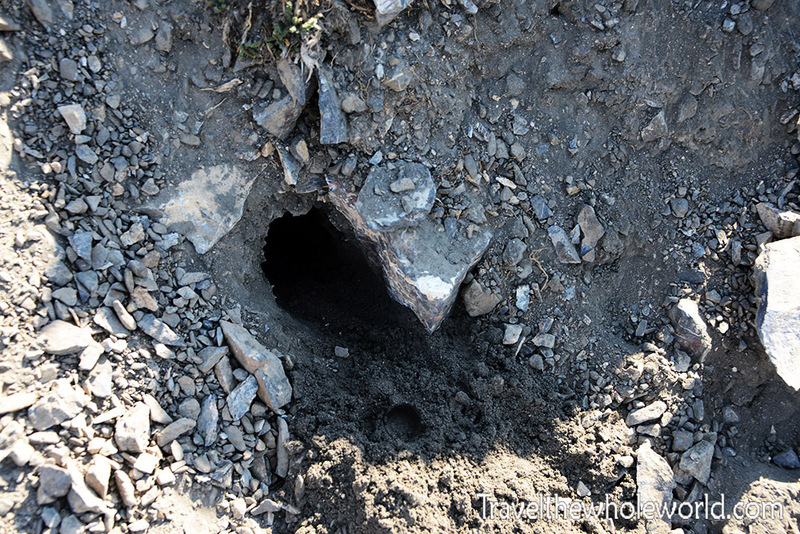 Things seemed so bare here that I was a bit surprised to see holes in the trail left by burrowing animals, likely marmots. 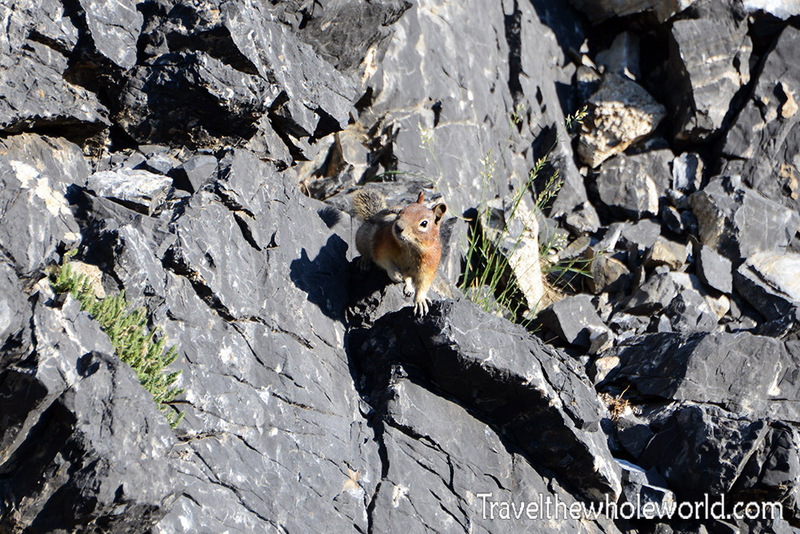 Then of all things I found a curious squirrel darting about the rocks and checking us out! I wish I took some photos of the actual ridge itself, but instead I only took them of the trail ahead. From the ridge you can see the entire part of the route. The ridge I was on is just outside of the photo to the right, and finally appears as it is getting steep and rises up to Chicken Out Ridge. Chicken Out Ridge isn’t all that long as you can see, but it’s much more exposed than it looks in the photo, and if you’re not well acclimatized you’ll have an added challenge of altitude! After Chicken Out Ridge you can see there is a large snow chute, and once that is crossed the terrain gets easier. Once the ridge was over we finally made it to the infamous Chicken Out Ridge. I wasn’t sure what really to expect, but definitely not to meet two Sherpas from Namche Bazaar, a place I had spent several nights in 2016! After a quick conversation I continued on. To be honest, I always thought that Chicken Out Ridge was nothing more than a very narrow and exposed trail that you simply walk across. A place like that does exist higher up on the mountain, but Chicken Out Ridge itself is actually a class four scramble! My friend had never done a class four climb before, and had considered turning around once he saw the exposure but decided to at least try a few minutes of it. I’m not really sure if Chicken Out Ridge is the entire way from where the class four starts or all the way to the snow chute. Either way, it quickly changes from an exposed ridge to a normal but exposed trail, with some random climbing parts in between. I have seen some websites call Chicken Out Ridge a class three climb, which I find a bit confusing. As someone who has down several class fours and fives on places like Matterhorn or Carstensz Pyramid, I’m not sure how this ridge wouldn’t be a class four, although I admit it’s an extremely short section! Once past the beginning the trail went from what I’d call a class four, to two, and then to a three where you have to scramble up this short gully photographed above. Regardless of what you call it, I’d say the only really sketchy part was photographed below. 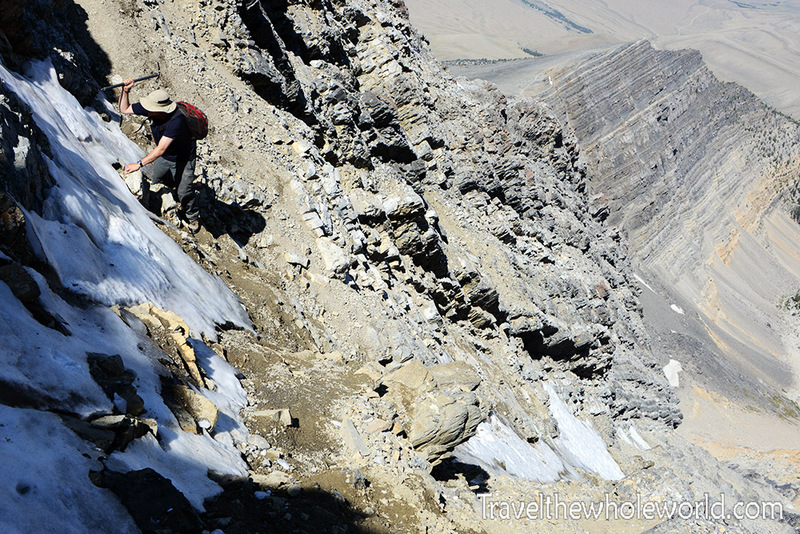 This was clearly just a class two trail, but some of it was eroded by melting snow and ice. 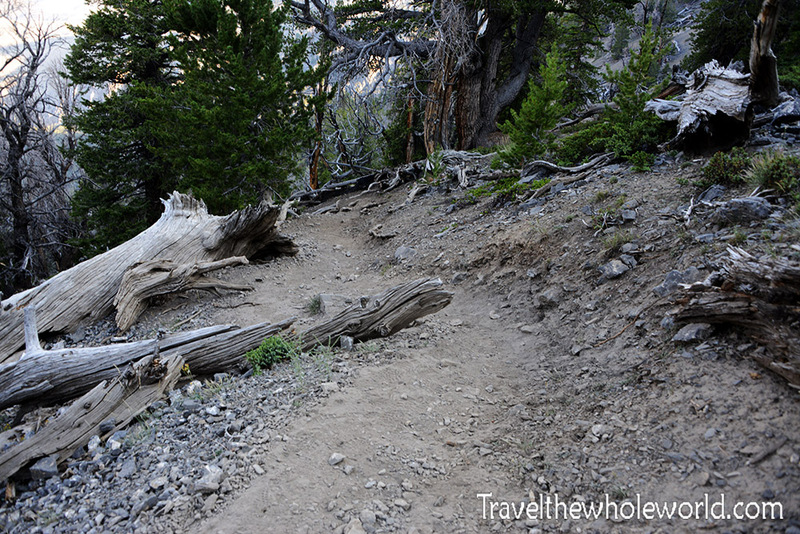 The part of the trail you had to step on was lose scree at a bad angle, and there were no handholds. We used our ice axes to bite into the wall for something to hold on to. The chance of falling was pretty low, but would have had high consequences. 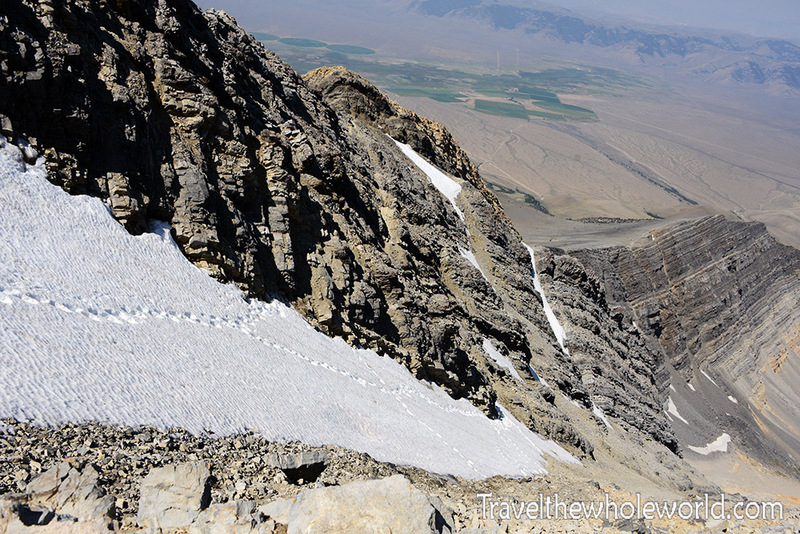 After Chicken Out Ridge, the next most famous part of climbing Borah peak is the snow bridge. For my friend and I, it was more of the snow chute. Most continue to scramble up the mountain and remain in the rocks until topping out, then they walk across the snow bridge to the other side. Since we had ice axes, we decided to traverse the snow chute upwards. It looks much more intimidating when you’re actually on it, but the foot holds from others were excellent and with an ice ax it was an easy ascent. In the photo below, you can see two others who had crossed the snow bridge and were now scrambling up the rocks to descend on the other side. 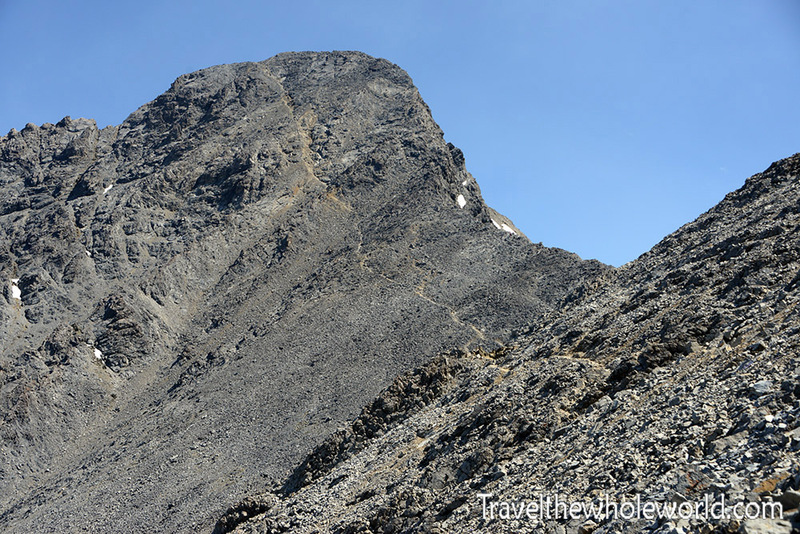 From this point, all that remains of Borah peak is a gentle walk followed by a scramble up the summit block. Immediately after the snow bridge you can see the summit again, as well as its steep trail. 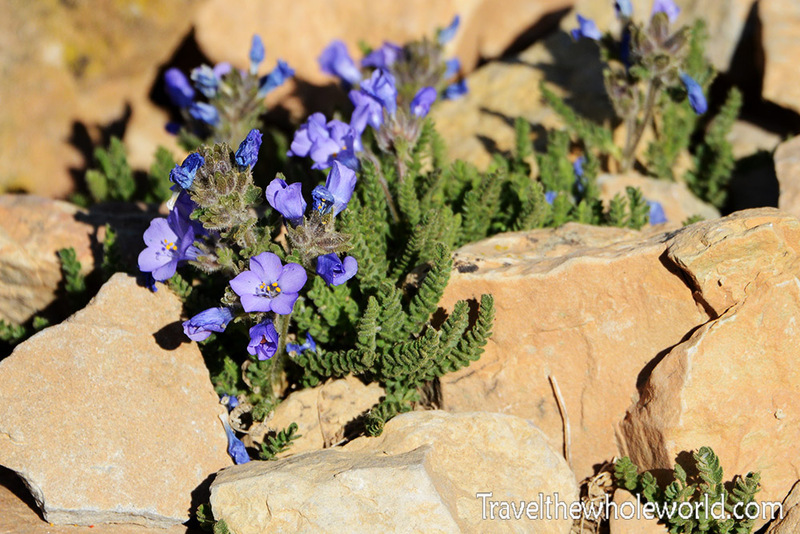 I found it pretty incredible that at 12,000 feet (3,650 meters), there were wild flowers that lived on the side of the mountain. This wasn’t so much because of the altitude, but more the fact that this area is covered with deep snow during the winter and is mostly hot dry scree in the summer. I saw the occasional flower all the way up towards the summit block, where I stopped to take this photo below. This shows the easy trail we just completed, with Chicken Out Ridge mostly out of view in the background. 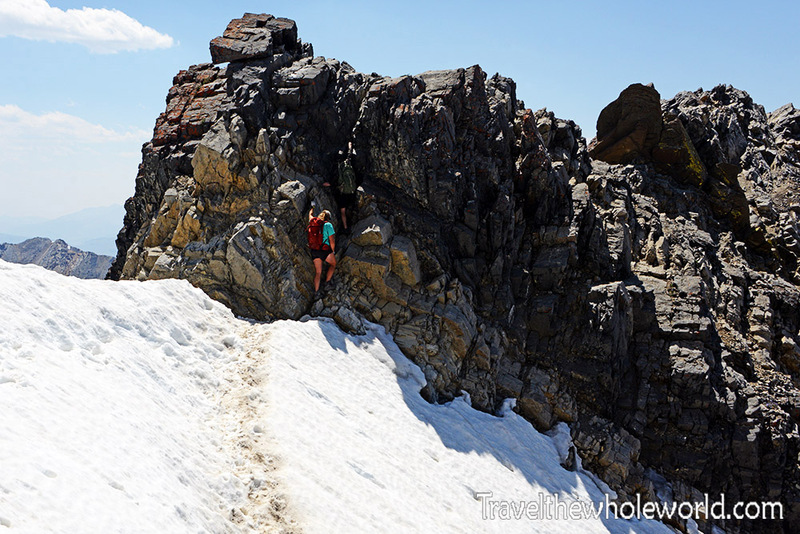 From the summit block, the short scramble doesn’t take you long to reach the top of Idaho. Being that the last significant mountain I had climbed was Mt. 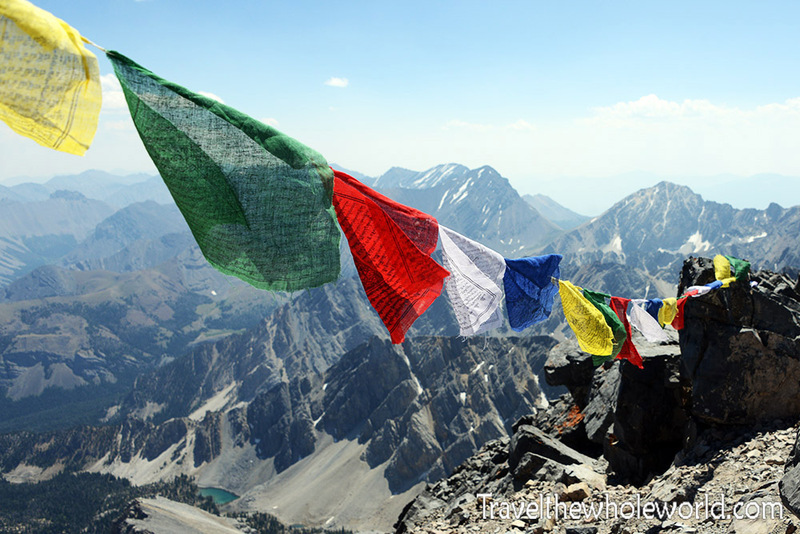 Everest the year before, I was surprised to see some Himalayan prayer flags at the summit! They were bran new, so clearly the two Sherpas I had just met had put them up only minutes ago. I was worried about being disappointed on this climb, but after reaching the summit I felt it was a legitimate peak with a special ending.